Mount St. Mary’s University is a private, liberal arts, Catholic university in the Catoctin Mountains near historic Emmitsburg, Maryland, with a satellite campus in Frederick, Maryland’s second largest city. The university offers more than 70 majors, minors, concentrations and special programs for traditional undergraduate students, and more than 20 adult undergraduate and graduate level programs. The Mount includes Mount St. Mary’s Seminary, the second oldest in the United States, and the National Shrine Grotto of Our Lady of Lourdes, an idyllic shrine for spiritual reflection located on the hill above the university. The Frederick National Laboratory for Cancer Research is dedicated to improving human health through discovery and innovation in the biomedical sciences, focusing on cancer, AIDS, and rapid response to emerging infectious diseases. 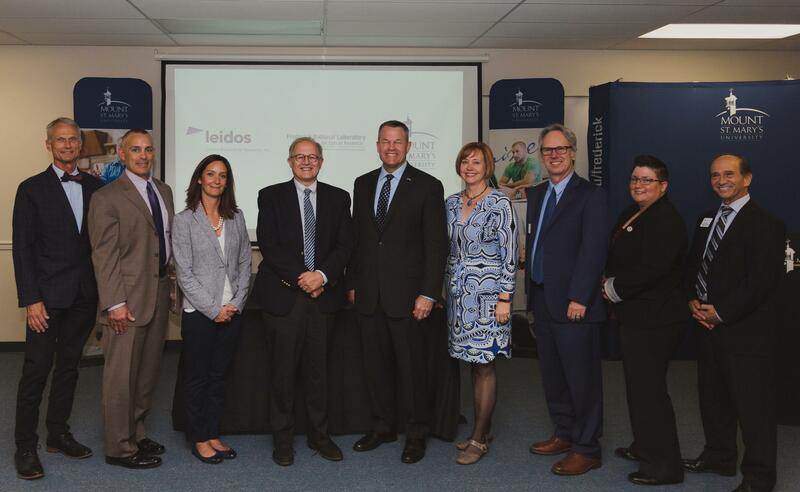 The facility is currently operated by Leidos Biomedical Research, Inc., and sponsored by the National Cancer Institute. Top image: From left- Frank Blanchard, director of public affairs and communications at the Frederick National Laboratory (FNL); Jim Pannucci, director of the FNL Partnership Development Office; Monica Slate, executive assistant at FNL; Ethan Dmitrovsky, M.D., director of the Frederick National Laboratory and president of the laboratory’s current prime contractor, Leidos Biomedical Research, Inc.; Timothy E. Trainor, Ph.D., president of Mount St. Mary's University; Jennifer Staiger, Ph.D., MSMU's associate provost of graduate, professional and continuing education; Boyd Creasman, MSMU's provost; Andi Overton, MSMU's director of business development; and Jack Chielli, MSMU's vice president for enrollment management, marketing and communications. Bottom image: Ethan Dmitrovsky and Timothy Trainor sign the partnership agreement. Images from signing ceremony at Mount St. Mary's University Frederick campus, October 9, 2018. Photos courtesy Mount St. Mary's University.